The French Arm is a web of transport routes, outposts, way-stations, and colonies. All of these far-flung settlements are served by fleets of commercial ships carrying supplies and colonists, military vessels providing protection and regulation, and explorer vessels forever pushing the boundaries of explored space. Outside of traffic between Earth and Tirane, the route from Beta Canum to Earth is the busiest in human space, with the route from Canum to Beowulf coming in second. Shipments from the industrial outpost at Bessieres account for nearly 30% of commercial goods produced for consumption by French nations on Earth, and account for fully 50% of the material produced for the ground-force militaries of the Empire. There are nearly 12,000 spacecraft of varying types in the French Arm. The vast majority of these are interface vessels and slow system ships. The actual number of starships is closer to approximately 2,500 in active commercial service. Of these, 30% are big bulk carriers. 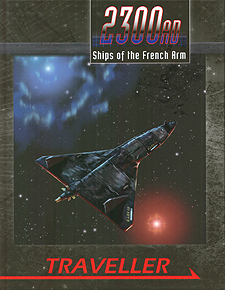 Ships of the French Arm is dedicated to vessels adventurers can interact with in a meaningful way, complete with deckplans for every one of them. While most merchant vessels fall into this category, a few military ships are also included, such as those relegated to patrol and customs enforcement, along with a pair of major combatants, provided to showcase the capabilities of these massive ships.